Well yesterday’s boudoir photo shoot with Joanna was certainly different! Jo brought along her 3 ferrets… all girls I might add. I have never had a close encounter wih a ferret before but they quickly got to know me after one scampered up my leg and hid under my cardigan. They really are the funniest little creatures… and apparently very good escape arstists and also just a little bit naughty. At the beginning of the session Jo thought she had left her outfit (pictured below) behind at home but eventually found it in the Ferret fox as the little scamps had dragged it in when she wasn’t looking! Jo also brought along a selection of interesting props from home resulting in a really creative, fun photo shoot. 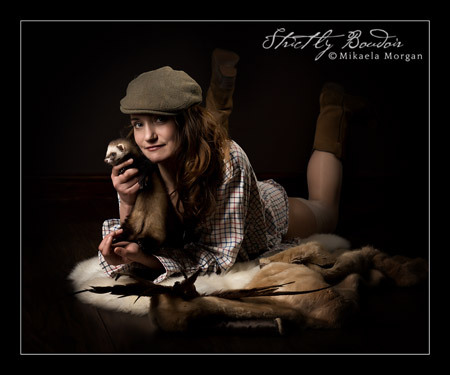 Here is a taster from today’s session… I love the pictorial, vintage feel of this image starring Clara the ferret. … and below with Billie the Ferret who is apparently the smallest and cheekiest of the three!